A mild soap to clean the inner ear leather (the “flap” part, excluding the ear canal). If the shampoo you use for your dog’s coat is a gentle shampoo use that. If your dog has particularly sensitive ears you can use a special sensitive soap for the ears. Any gentle, perfume and dye free wash made for either babies or ladies in particular will work just wonderfully for the ear flap itself, the inner side of the flap. Your dog won’t care if his ear is being washed with “Summer’s Eve” or “Aveeno”, I promise. A thin towel or wash-cloth or some cotton balls or you can use ear-cleaning pads made specifically for dogs. Try to avoid any with alcohol in the ingredients to avoid over-drying the ear and causing itching. If your dog has dry, itchy ears you’ll want some kind of moisturizer. You can use a product made for dogs if you like but a simple oil like coconut oil, sweet almond oil, extra light olive oil or mineral “baby” oil (without fragrance) will work beautifully. Turn down the enthusiasm when rubbing your dog’s ears during cleansing or you can harm them by over-abrading the delicate skin. Don’t rub too hard, just enough to get off dirt and/or wax. Get a tube sock and sprinkle a little warm water onto the sock. Stick the sock into the dryer or microwave and heat until nice and warm (not hot). Put your bottle of ear canal rinsing solution into the tube sock to make it nice and warm. No one likes liquid shoved down their ears and when that liquid is cold it is especially unpleasant. This little trick takes just a minute before you begin cleaning and by the time you’re ready to use your ear canal rinse it will be pleasantly warm (at least not freezing!). This same trick is awesome if you ever need to flush eyes out with saline solution. Body temperature solution is ALWAYS more comfortable! Don’t go cramming your cloth down into the dog’s ear canal. You won’t clean the ears out like that; you’ll just shove wax down into the ear and cause an impaction. So stop it. Swipe in and clean in a scooping method to wipe out gunk. Otherwise let the solution you’re putting into the ears do the work for you by loosening and bringing up any debris that requires removal. The gunk will come out when your dog shakes his head. If your dog hates having his ears cleaned keep the sessions very brief at first and give him a whole lot of treats. Make it fun for him. There is no reason your dog should be miserable. In the same way my pediatrician gives my kids lollipops when they go to see her make sure you reward your dog’s devotion and tolerance of unpleasantness with lots of yummy treats and cuddles. And don’t worry too much. 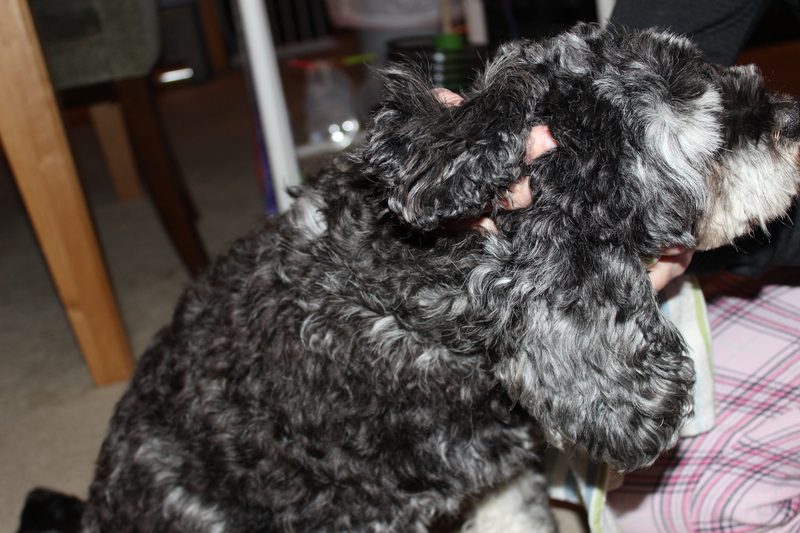 Most dogs love having their ears rubbed out. They learn to tolerate the bizarre sensation of cleaner going into the ears. If your dog loves having his ears cleaned then use that as a way to help train some behavior you want, like jumping voluntarily into the bathtub at bath time (that’s one way I train my dogs to do that). 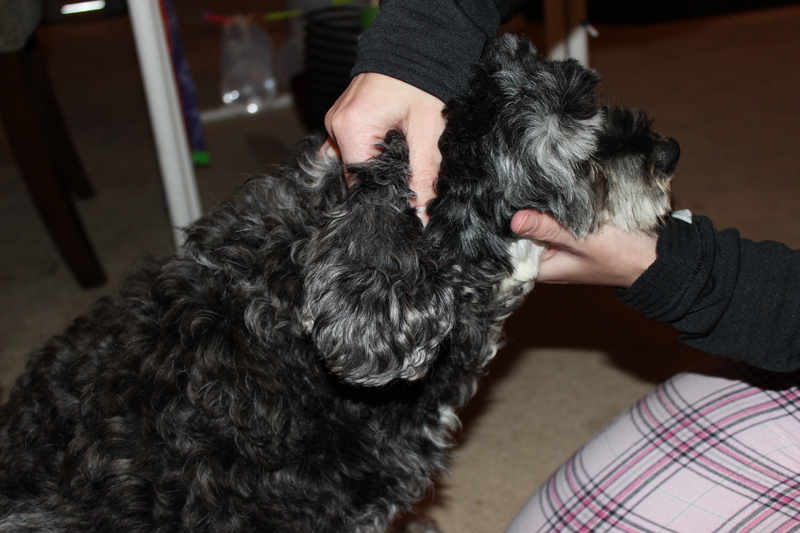 Encourage your dog to jump in and if he does it reward him with a nice ear rub. If he doesn’t voluntarily leap in simply place him in the tub and give him an ear rub anyway. Do it a few times in a row and from there on just clean ears before the bath and you’ll have a dog that hops right into the tub instead of hiding under the dining room table when they hear the words “bath time”. Use your mild soap or shampoo to gently scrub the inner ear flap/leather, but not deep into the canal. Use your fingers to clean the hairy inner ear leather and a warm washcloth to clean the outer ear canal. Gently clean off any buildup you see. Yeast and bacteria will thrive in stagnant wax build-up. Wax is an important lubricant and protector, so don’t go crazy or you’ll irritate the ear more but we shouldn’t see gunk built up on the ear. Remember that, for the most part, natural is better. Clean the part of the ear canal that you can see. Wipe it out with pads or cotton balls but not soap. You can go fairly deep into a doggy ear canal without worrying about injuring them. Use a wiping, scooping motion to avoid pushing ear wax further into the canal. Rinse the soap from the ear flap with warm water. Do not pour water into the ear canal. In fact, when rinsing, be careful not to get water into the ear canal at all if it can be helped. If a dog isn’t fully trained and reliable to sit perfectly still during rinsing then use a washcloth or cotton balls to gently occlude the ear canal (cover it or loosely plug the ear canal) just in case. Some people choose to keep the ear canals plugged gently with cotton balls for bath time to avoid water in the ears as well. If you happen to have a dog prone to infections it isn’t a bad idea. 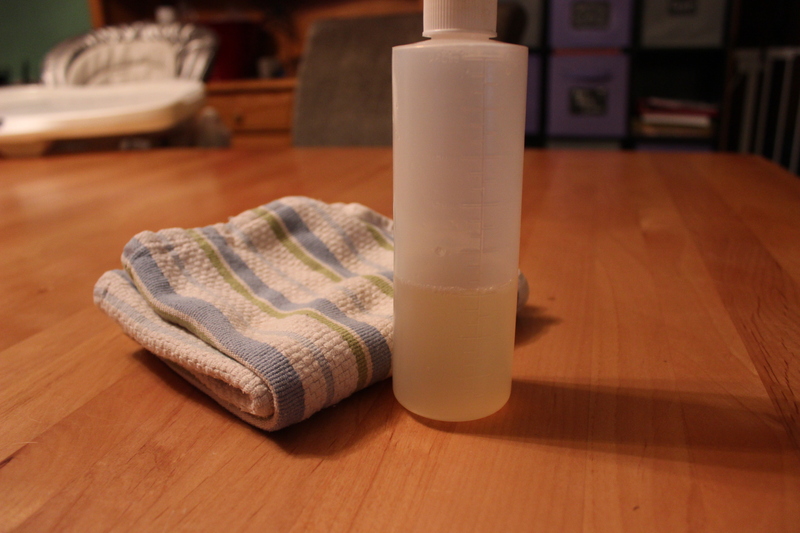 Alternatively you can rinse the shampoo off with diluted apple cider vinegar (half water, half vinegar). Then if some does happen to get into the ear canal you don’t have anything to worry about. We still aren’t aiming to hose out their ears, though. To restore moisture you can follow up with a little oil. I personally use extra light olive oil, coconut oil, grapeseed oil or sweet almond oil (whatever I have in the house). Mineral oil/baby oil can also be used but avoid anything with fragrance. Any light, sweet oil will work. You can find all kinds of great oils used for massage or skin hydration, like coconut oil or shea butter, etc. Use oil sparingly. Just put a bit on a cotton swab or your finger tips and gently swab the outer ear flap. Don’t put any oil into the ear canal. This is for the outer ear leather and skin only. Rinse the dog’s ear canal out with a solution like the Eden Family Ear Remedy, or a homemade solution that is half vinegar, half water. You want to make the ear environment slightly acidic since yeast and bacteria alike thrive in alkaline environments. If you suspect an infection or have a pup prone to infections you can also use a product like Zymox Enzymatic Ear Cleaner. 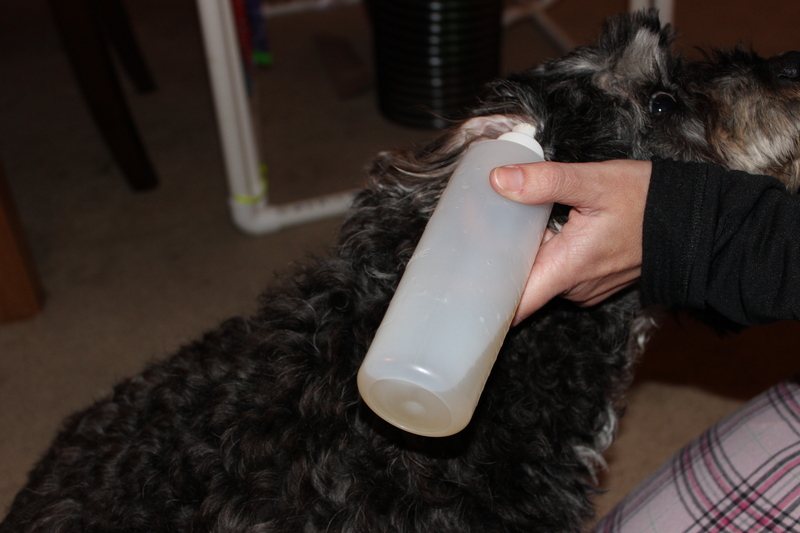 I use the variety with hydrocortizone cream for any dog that seems to be having itchy ears or for rescues that come to me with chronic infections that require serious treatment. There are various other ear cleansers on the market. I don’t like a common cleaner called Epi-Otic which is often prescribed by vets. I find it doesn’t work at all and the dogs really hate it. You do not want to use any alcohol or other common ear solutions that promise drying, because that is what they do: dry and strip the skin of all its protective properties, making your dog itchy and starting a whole cycle of ear problems you really want to avoid. Be careful with anything containing tea tree oil. That is toxic to dogs when ingested. Its good stuff for the skin and ears but ensure it is thoroughly rinsed off any skin the dog might be licking. Generally ears are a safe space for properly diluted tea tree oil. Pour a little solution into each ear. Pinch the ears closed at the base of the ear and gently massage the ears. Your dog will probably appreciate this attention. Now stand back (after about 30 seconds of massage) and let your dog shake his head to remove excess solution and anything the solution brings up. Dry the ears. Use a towel or dry washcloth and dry off the ears and into the ear canal (gently). If you have good, patient and tolerant dogs (like my little fluff balls) you can set a blow-dryer on low and warm (a dryer with a “cool” button) and carefully dry the ear leather and hair (don’t blow the air into the canal, that would be uncomfortable to say the least. Cover the ear canal with a towel if blow drying the ear leather). Since my blow dryers are a bit too hot even on warm I will hit the “cool” button on and off to regulate the temperature. A good rule of thumb is if the blow dryer is too warm for your hands it is too warm for your dog. If you can’t get your dog to let you dry him with a blow drier see if he’ll allow you to clip his ears together over his head (like a big ear-bow) so there is some circulation to finish drying things out. This could be a good use for that big turquoise scrunchie you have stuffed in the back of your bathroom cabinet since the 1980’s. Any gentle clip will work. A stronger butterfly type hair clip can be used with a washcloth to avoid the “teeth” of the clip hurting your pup. If your dog won’t allow any of those don’t stress too much. The vinegar will be enough to stop an infection from setting up shop. Make sure you towel dry and you can play with his ears a bit (flap them like a bird, flop them around, etc… I know I’m not the only person who does that). I clean the ears with these steps at every bath (usually twice a month, less in winter and more in summer when we’re out getting muddy having fun). If my dogs are bathed more than twice a month I just wipe the ears out with cleansing pads and only rinse out the ear canal itself 1-2 times a month. I rinse the ears with a solution once a day for a week if I am treating a rescue dog with an infection, and then once a week for a month, and then monthly/bi-monthly after that. 3. Tip the dog’s head so that the ear you are treating first is toward the ceiling. 5. Immediately (to prevent your dog from reflexively shaking the solution all over you) squeeze the base of the ear in a pinch-like manner (you should NOT hurt your dog but still be firm) and gently work your fingers and thumb in a circular motion opposite to one another. 6. Massage the base of the ear in this manner (or any other way you prefer) for a good 15-30 seconds. 7. Place a folded or waded washcloth or small towel over the ear canal in preparation to treat the other ear. 8. Now you’ll switch sides. Tip the ear you just treated to face the floor and tip the other ear toward the ceiling to be treated. No need to allow your dog to shake his head just yet. 9. Treat the second ear the same way you treated the first. 10. Hold a washcloth or small thin towel over the ear opening of the second rinsed and massaged ear and allow solution to drain out of ear. 11. 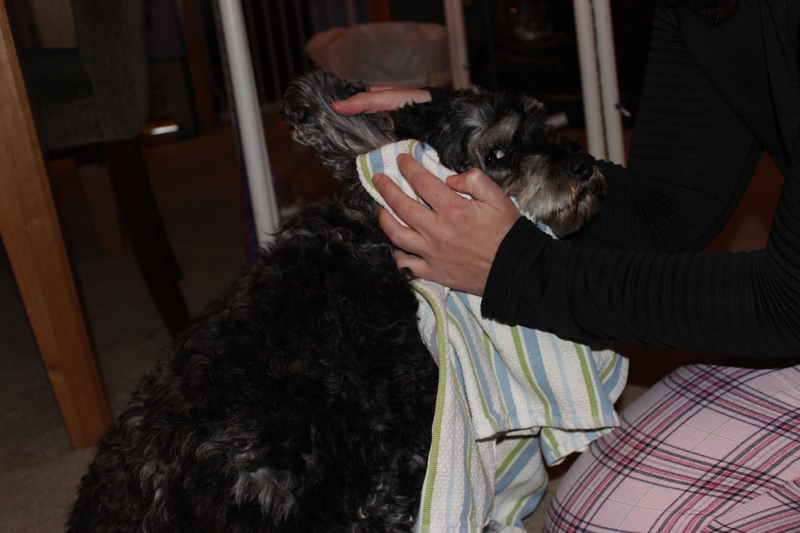 Rub both ears dry gently with the towel or washcloth. Don’t take long to do this or your dog will thank you by shaking liquid all over you. The key to success is to do all of this as quickly as possible so your dog can relieve the odd sensation by shaking his head. 12. Jump out of the way and allow your dog to shake his/her head several times to force out whatever solution you were unable to absorb with the washcloth. 13. Wipe the ears out gently with a towel or ear cleaning pad to wipe up any gunk the solution has brought out of the ear canal. You can do both ears at the same time when you get more proficient at it (time saver) and this is always easiest when done in a bathtub as anything that is shaken out of the dog’s ears will not be sprayed all over your house. 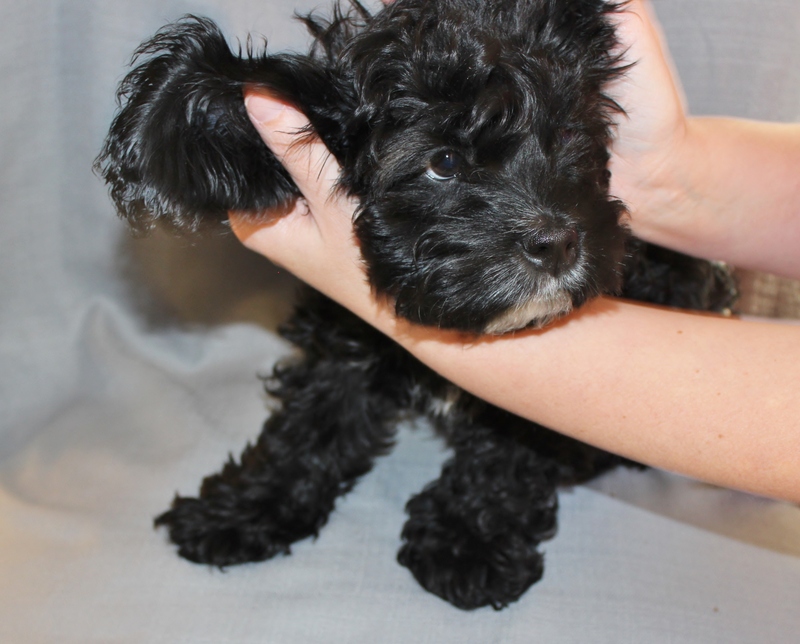 This entry was posted in Dog Health, grooming and tagged dog ears, dogs, ear infection, how to clean a dogs ears. Bookmark the permalink.